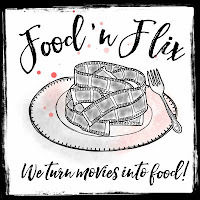 Here we are at the February 2019 edition of Food'N'Flix. And this month, my friend Debra of Eliot's Eats is hosting. You can read her invitation here, but she's invited us to watch Crazy Rich Asians. * In addition to the movie being the pick of the month here, the Cook the Books crew is reading the novel for their February-March selection. So, you can join in for the double header, if you'd like. I actually watched this movie twice on the plane to and from Denmark for the holidays. I watched it on the way there, then decided I wanted to see it again. And with an almost twelve hour flight, I watched several movies! This was just one of them. 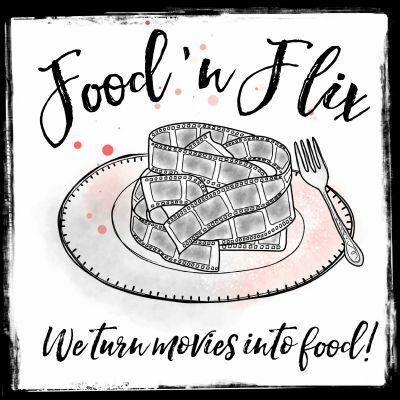 Then when I realized that it was the February pick, I bought the DVD and have watched it - with my foodie glasses on this time - twice so far. This is one of those rare instances in which I actually prefer the movie to the book. And, I mean, vastly prefer. That almost never happens for me. I didn't care for the book - and I'll share more about that for Cook the Books - but I thoroughly enjoyed the movie. All. Four. Times. 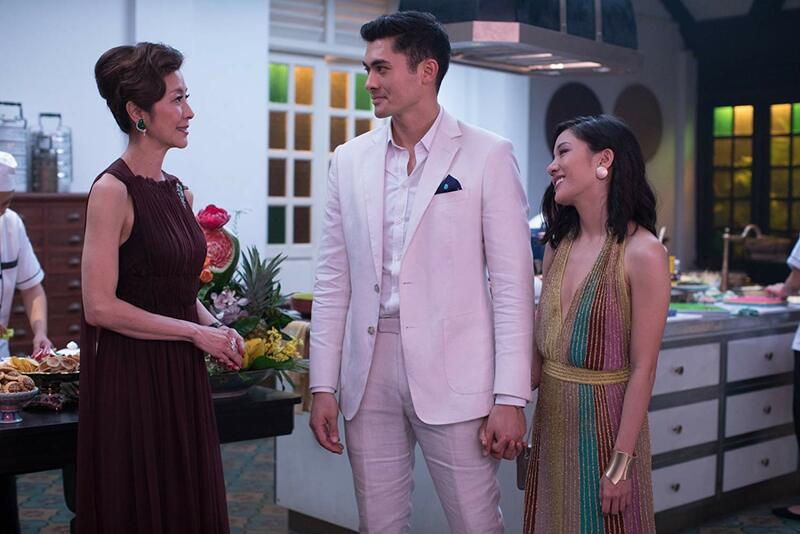 At the base of it, Crazy Rich Asians is a love story between a Chinese-American woman, Rachel Chu (played by Constance Wu) and her Singaporean boyfriend, Nick Young (played Henry Golding). They have traveled to Singapore to attend a wedding and Rachel discovers that Nick is from a crazy rich family. 'Crazy rich' is a single descriptor, not 'crazy' and 'rich', but 'crazy rich.' His cousin Astrid doesn't even blink when she hears 1.2 million as the pricetag for some earrings she's considering. And despite, as she laments to her mom, being so Chinese that she's “an economics professor who's lactose intolerant,” Rachel is not Chinese enough for Nick's circles. Nick's mother, Eleanor Young (played by Michelle Yeoh), views Rachel as an outsider who is more focused on her own happiness and passions than on family and tradition. During the trip, Rachel must navigate the turbulent waters of his old-money friends, meddling family, and an old girlfriend who is determined to make Rachel run. 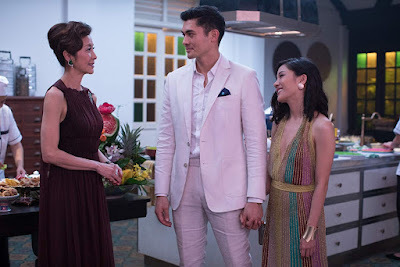 Add to the Crazy Rich Asian tapestry luxurious cityscapes, lush houses, and sumptuous food-filled scenes and you have a truly beautiful film. When Nick and Rachel land in Singapore, they are immediately whisked to the real-life Newton Food Centre where street food vendors, known as hawkers, peddle their wares and some, as Nick notes, have earned Michelin stars. You see fresh crab slung on the scale and fresh lobsters sliced in half and mopped with a sauce before grilling. You watch the characters, including Nick's soon-to-be-married friends Colin and Araminta, eating Hokkien Mee, Satay, Ice Kaching (a Malaysian shave ice with beans), and more; they wash it all down with hefty mugs of cold beer. Then there are the overly extravagant parties where food is a status-symbol. 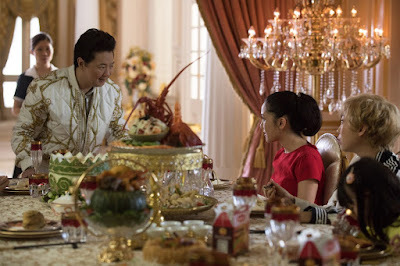 Rachel visits her college friend Peik Lin Goh and the family lunch table is laden with whole lobster, abalone, and more in their nouveau-riche gilded house that was inspired by Versailles mixed with Donald Trump's bathroom. And in spite of the lavish spread, the twins are noshing on nuggets! At Nick's grandmother's house, Rachel is introduced to Eleanor while Nick's mom is overseeing the kitchen for a lavish dinner party. The colorful rainbow desserts stuck in my head, but more importantly was how Eleanor must approve of everything before it is served to the guests. Perhaps the most meaningful food scene of the film revolves around dumplings. Nick previously told Rachel that his grandmother makes the best dumplings. So, she goes to the house, sits with cousins, aunts, and more relatives as Nick shows her how to make them. It's an important scene, too, because we get the story behind Eleanor's massive emerald engagement ring. But I won't spoil it. Just watch the movie. Okay? "You put the baby in bed. You tuck, tuck, tuck. Same on the other side. And you give him a kiss goodnight." That's so cute. Then you eat the baby. Cousin Oliver adds, "I, on the other hand, was taught by Grand Auntie Mabel. You put the Botox in the face...and then you pinch, pinch, pinch. Then voilà." Funny thing: When I served these, my husband asked where I had picked them up. Ummmm...I made them. From scratch. I couldn't decide whether to be insulted or flattered that he thought they were restaurant or commercially made. I read several different recipes before coming up with this one...and I didn't use a rolling pin so my skins were on the thicker side. Next time! Combine the flour and salt in a large mixing bowl. Slowly pour in the boiling water while stirring. You'll get a coarse mixture with large pea-sized lumps. Stir in more water, 1 T at a time as needed, to form a dough ball. Knead the dough, adding more flour as necessary, until the dough is smooth and slightly sticky, approximately 10 minutes. Cover the dough with a damp towel and let rest for 20 minutes. In a large mixing bowl, combine all of the ingredients and beat until well-combined. To form the dumplings, divide the dough into approximately 24 walnut-sized balls. Press or roll them out into 3 or 4" circles. Keep the surface floured as needed so that the dumpling skins don't stick to your work surface. Place 1 T filling in the center of each and fold in half to make a half-moon shape. Press the edges together to seal the dumpling, then pinch to pleat. To cook dumplings, bring a large pot of water to a boil. I used a pasta pot with a strainer that I could easily lift out, drain, and repeat. Heat a thin layer of oil in a large skillet over medium heat. Boil the dumplings in batches for 5 minutes. Drain the dumplings, allowing excess water to drip off. Any excess water will cause the oil to spit and sputter. Take care. Gently lower the dumplings, flat side down, into the hot oil. Cook until the dumplings are browned on the bottom, approximately 4 to 5 minutes. Transfer to a plate lined with a paper towel and let cool slightly. Serve the dumplings with the dipping sauce. In a small bowl, combine all of the ingredients. Whisk to combine. I'll be writing a separate post - and sharing a new recipe - for the Cook the Books' Crazy Rich Asians event. Stay tuned. Well, unlike you I preferred the book over the movie. I love that you made the dumplings and the name you gave it. I'm anxious to see your next recipe and the book review. Thanks! I made my mom give me the book back yesterday. She hasn't read it, yet, but I told her I needed to give it a second chance this month. I made gyoza about two years ago and they were so ugly I didn't post them up. It was super time consuming too. I always love to see what you'll cook up for FnF and CTB! Definitely a compliment that your dumplings looked like they came from somewhere where they make them regularly! This makes me want to try them! The dialogue about eating the dumpling baby reminded me of the Pixar short animation, Bao, that was shown along with Incredibles 2!